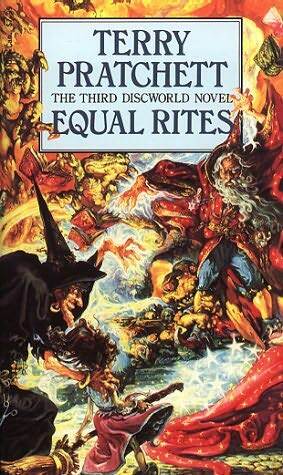 The third book in the Discworld Series introduces different characters than in the first two. I have no idea when this book is set in relation with the first two, but it's not that important. This one deals with actual magic. There are only two ways to become a full fledged wizard, you either have to invent a spell that no one has invented or you inherit a Wizard's Staff. So when the great wizard Drum Billet is about to die he hands his staff the eighth son of an eighth son. There's only one slight problem, it isn't a son, but a daughter. As Esk grows up, weird things happen around her and Granny Weatherwax, the local witch, is worried because there are no women wizards only witches. So she trains Esk in herbs and headology, the magic behind witchcraft, but it's obvious that Esk has a different sort of magic, so she hands over the staff that Esk was given as child, that she had hidden for so many years and they set out for the Unseen University (the school where all wizards go to get trained). After a few adventures they reach the University. The wizards don't let her in, obviously, since no woman has ever set foot into the University. Granny discovers that isn't true, since there are servants and cooks and most of them are women. So Esk becomes a servant and tries to learn magic. There is a very promising student who just arrived at the University, Simon, who explains magic in way that other wizards never even thought about before but, unfortunately for him, that attracts the attention of the Things. They live in the darkness waiting for those with large amounts of magic to show up and try and steel their bodies. There was nothing really exciting about this book. We learn about how magic works in this universe, and about the Things but that's about it. It wasn't terrible, but it wasn't great either. All it was about was Esk and Granny's journey from point a to point b with a little bit of sexual equality thrown in. There was nothing else to it. I have really nothing to say about it. I enjoyed the first two books much more. I just wanted a little bit more depth in this book.